FGF-23 is a hormone that is secreted by osteoblasts within the bones. This protein works with the kidneys to help regulated levels of phosphate in the blood/serum. The kidney gets rid of excess phosphate by excreting it in urine. When more phosphate is needed, the kidney reabsorb phosphate into the bloodstream. 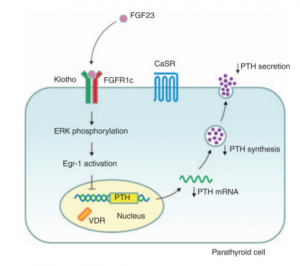 FGF-23 signals the kidneys to stop reabsorbing phosphate into the bloodstream. This fibroblastic growth factor binds to a receptor protein called FGF receptor 1. These receptors span the membrane of kidney cells. The binding of the protein and the receptors stimulates a signal cascade that stops phosphate reabsorption into the bloodstream. Phosphate plays a critical role in the formation and growth of bones in children and for maintaining bone strength in adults. An imbalance in levels of FGF-23 in the body causes high or low levels of phosphate in the bloodstream. Low levels of phosphate in the blood can result in hypophosphatemia rickets or osteomalacia, which is a weakening of the bone which can cause bone pain and fractures. High levels of phosphate in the blood can indicate kidney disfunction.